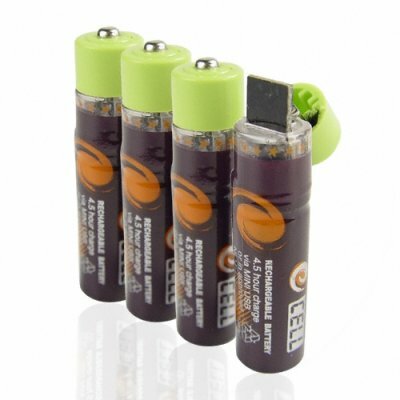 Successfully Added USB Rechargeable AAA Batteries Set of 4 to your Shopping Cart. USB Rechargeable Batteries -What could be simpler or more convenient than charging up your batteries from a simple USB port on your computer? Nothing and with these magical USB batteries you can do just that. The high quality batteries (550mAh) will power any device you need them for, then when the time comes take them out, pop off the caps and insert them into a USB port for quick easy charging. There is even a handy blue LED to show when the batteries are charing which turns off when they are fully charged. No more bulky chargers and unsafe cables all over the place. These are also environmentally friendly as they contain none of the harmful cadmium in Ni Cads and none of the resource waste from traditional alkaline batteries. An awesome new technology that shows the future in batteries available now at great wholesale prices from Chinavasion..